With the dawn of a new era of Pokémon E-Cards, comes a whole new set of rules that could change the face of play forever. This could be what gets you playing again after a year of neglect and a disturbingly healthy bank balance. Aside the obvious card-e additions there are three main new rules. First of all we have "Supporters". These cards can only be played once a turn and are a type of trainer. Designed to even the playing fields, these cards have wonderful effects such as discarding one card and drawing three (Bill's Maintenance)- its easy to see why they are one supporter a turn. For years there has been one status changing missing from the ranks, aside poison, confusion and paralyze. Finally you can burn your opponents rear end with the introduction of burning cards. 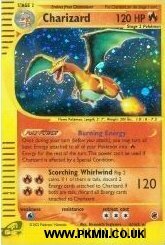 Each turn, burned Pokémon will take 20 damage (two damage counters), unless they are benched or evolved. To get rid of this Gastly product of creativity, you must flip a coin at the end of your turn- if heads you'll be hosed down. Another new rule, is a variation on the old Pokémon Power lark. Poké-Body's will only effect the Pokémon that has the Poké-Body and unlike Pokémon Powers, will not be prevented with a side-effect like sleeping or burning. 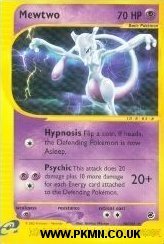 As for cosmetic new things, each card will apparently have a "parallel" reverse holographic card- adding to the already mammoth 165 card set. As for individual cards, Wizards have decided to rain on our proverbial parade by making Gust of Wind and Energy Removal have coin flips- and new names - Pokémon Reversal and Energy Removal 2. A new trainer, TM01 looks likely to start a new trend in "cop out" trainer cards with bland names- you will have the ability to let your Pokémon use the attack on the trainer rather than its own. Another potentially major change is the lack of resistance among basic Pokémon- it just ain't gonna happen. That's about it for what's new in Expedition - its going to be interesting. on Fri 21 Sep 2007 16:29:02 UTC. whoa that Mewtwo is SWEET! !